For more than four decades the voice of Judy Cheeks has been ringing out all over the world. Her fans or “friends” as she calls them have shown great love and appreciation for her talent as a singer and songwriter but also love her very personal and approachable manner on and off the stage. Every song she sings is more like a conversation with a friend rather than a commercial loop to encourage sales. It was her love and concern for a very dear friend that led to the release of her 2018 Album Danger Zone. Knowing how Ill her friend was she sat at the piano and wrote a song just for him. She played it over the phone and brought him to tears. Seeing how happy it made him, Judy decided to send him other songs she had written that had just been sitting around…Her friend loved them so much he encouraged her to release them… Because she felt it would give him joy she allowed him to handle the project without limits. There were no elaborate marketing schemes in place, no expensive promotion plots or even expectations of great success, but through word of mouth, an act of love for a friend, “Danger Zone”, blessed the lives of many and became a hot item among Judy’s fans with rave reviews from people she had no idea would be listening. So, the love continues, Shaun O’Shea is defying all the doctors and is still putting his efforts into sharing his friend and her music with the world. 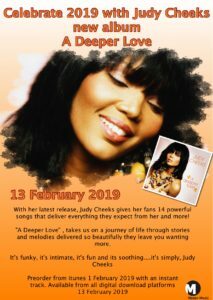 With her latest release, “A Deeper Love” releasing on all Digital Download platforms on 13 February 2019 – Judy Cheeks gives her fans 14 powerful songs that deliver everything they expect from her and more!